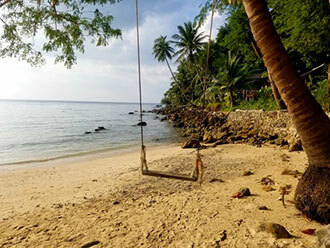 New Location: Shri Kali Ashram is now located on the tropical island of Koh Phangan, Thailand. Our ashram spans several acres of secluded jungle hills, which overlook the sea. Here we have the opportunity to develop our community in a peaceful environment well-suited to the relaxing immersive study and practice of Traditional Tantra Yoga. The new season will run from the 1st of November, 2018 to the 28th of June, 2020. Our teacher certification classes are held the 1st three weeks of each month (1st-21st) see Yoga Teacher Training. The fourth week of the month (22nd-28th) students are welcome to stay on and experience ashram life – deepening their practice, study, integration and relaxation at regular price rates (363 USD all-inclusive a week) but in an informal setting. You may stay as long as you want to study with us on a weekly basis. Rates decrease after two months stay. 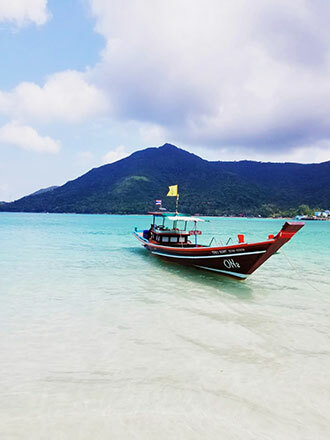 The last ferry from Koh Samui to Koh Phangan runs at 6 PM, so if your flight arrives in the evening, you will need to plan to stay one night on Koh Samui.